Piso Fare: You can obviously feel the heat of summer 2014. That signals that it is perfect to have a summer vacation! And definitely, you have to hit those perfect hotspots to unwind and experience the sun! Check out below some of the popular destinations in our tropical country! #CEBseatsale! Quoted DOMESTIC one way fares are inclusive of Base Fare, Php 120 Web Admin Fee, 12% VAT, Php 200 Terminal Fee for flights transiting in or exiting from Manila/Cebu Station and 7 kg hand-carry baggage allowance, but exclusive of Fuel Surcharge ranging from Php 200 – Php 450, Php 15 Aviation Security Fee for flights coming from Cebu and check–in baggage. Terminal Fees ranging from Php 50 – Php 200 for flights originating from non-Manila/non-Cebu Stations must be paid at the airport. Quoted INTERNATIONAL one way fares are inclusive of Base Fare, Php 120 Web Admin Fee, and 7 kg hand-carry baggage allowance but exclusive of Php 550 International Terminal Fee, Php 1,620 Philippine Travel Tax, Fuel Surcharge ranging from Php 910 – Php 2,958, Country Specific Taxes ranging from Php 403 – Php 990 and check-in baggage. Promo fares have limited availability and are non-refundable but rebookable subject to the following rebooking fees: Php 1,200 for Domestic destinations and Php 2,000 for Short-haul International destinations plus fare difference. Please note that booking fee rates range from Php 120 – Php 200 depending on purchase channel. For your convenience, flight changes, availing of prepaid baggage allowance for check-in baggage and web check-in service can be done up to 4 hours before scheduled flight. AVAILABLE NUMBER OF SEATS ON SALE PER ROUTE and v.v. DOMESTIC: Manila to : Bacolod: 51,865; Caticlan: 9,681; Cebu: 73,197; Iloilo: 52,923; Kalibo: 16,006; Laoag:3,735; Roxas: 8,115. Cagayan de Oro to : Bacolod: 106. CEBU TO: Bacolod: 10,358; Busuanga: 27; Cagayan de Oro: 24,956; Caticlan: 4,865; Dipolog:2,086; Dumaguete: 251; Kalibo: 4,060; Surigao: 5,480; Zamboanga: 4,976. Davao to : Bacolod: 3,013; Dipolog: 155; Iloilo: 4,486; Zamboanga: 4,816.Zamboan ga to : Tawi-Tawi: 6,050 and v.v. INTERNATIONAL: Manila to : Bangkok: 11,731; Bali: 622; Brunei: 6,041; Guangzhou: 5,246; Hanoi: 2,965;Ho Chi Minh: 7,388; Jakarta: 1,425; Kota Kinabalu: 4,469; Macau: 1,425; Phuket: 3,092; Taipei: 3,073; Xiamen: 2,188. Cebu to : Hong Kong: 2,567. Clark to : Hong Kong: 3,373; Macau: 3,187. Iloilo to : Hong Kong: 1,380 and v.v. 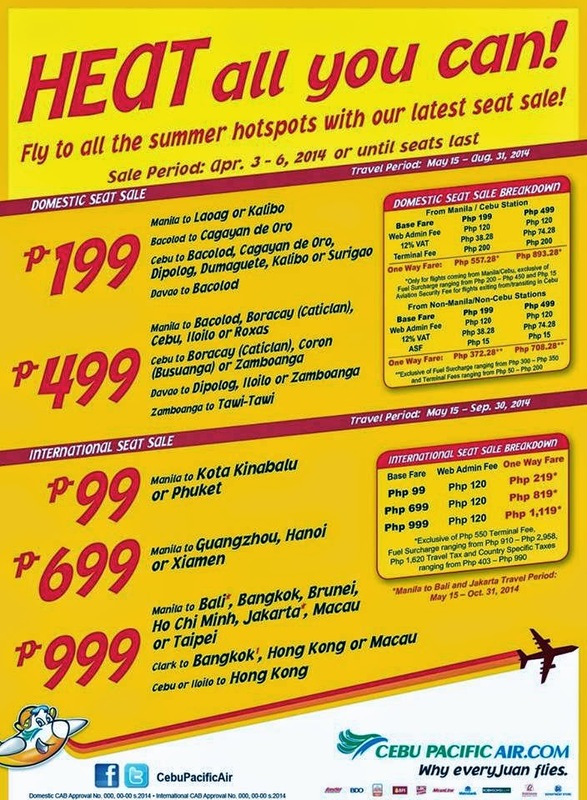 Book now at https://www.cebupacificair.com/ today!